ON SUNDAY 7 July I went on a five mile walk along the disused Fallowfield Loop Line from Fallowfield to Fairfield. The walk was instigated by the Manchester Civic Society and organised by Costel Hornasz and Rob Trueblood, who are campaigning for the route to be turned into a 'greenway' for use by walkers, cyclists and others. Our railway expert was Eddie Johnson, author of a number of books and a collector of railway photographs. The weather was drizzly at first, later overcast, but dry. THIS IS MY POSTCARD of the walk along the Fallowfield Loop Line. In the top left picture we are walking along the line in Fallowfield, after descending onto the trackbed. The top right photo shows Kingsway - the bridge carrying the line to Manchester Airport is just visible at the top. The bottom right picture shows the bridge carrying the line from Manchester Piccadilly to Stockport and London Euston - visible further on is Stockport Road and Levenshulme (later Levenshulme South) station building, now a second hand furniture store. The bottom left picture shows the old cast iron footbridge east of Levenshulme Station. FALLOWFIELD STATION, as it looked in 1999 - half the station building has been demolished to make way for the entrance to Sainsbury's - a bizarre marriage of late Victorian and pre-Millennium, but at least the old building was saved. This was our meeting point for the South Manchester Loop Line walk. The South Manchester Loop Line was opened in 1892, and provided regular passenger services until 1958. It continued in freight use until October 1988, when it was taken out of use completely. It isn't going to be integrated into the extended Metrolink system, hence the plan to turn the line into a greenway. We descended onto the line down a tricky slope near Ladybarn Lane- after that, walking on the ballast left after the lines were pulled up, the going was mostly easy, with not much mud. As well as stinging nettles, bushes, butterflies we also encountered abandoned cars and bits of household appliances. Eddie Johnson told us how the line might have been saved had there been sufficient money in 1947 to pay for electrification west of Reddish. A railway depot was built here in 1954, but it was never as busy as it was hoped and closed in 1981. The site is now like a lunar landscape. As part of the preparations for Metrolink, LRT vehicles were tested along a stretch of track north of Hyde Road - I took a ride with friends back in 1988. This track is now gone, and the deep cutting near Abbey Hey has been filled in up to bridge level with landfill (household waste) - a sad end for a once important rail route. The end of the line is at Fairfield station. 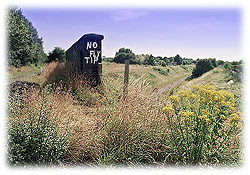 The border with Tameside is marked by end of the landfill and a sole remaining gantry which used to carry overhead electricity cables. The busy Manchester to Guide Bridge and Ashton line is just beyond the trees. Our walk ended there too - a fascinating journey across south Manchester, which we saw from a new angle. Once the preserve of steam engines and diesel trains, this route will soon - we hope - be used every day by walkers, cyclists, horse riders and others. If you'd like more information on the South Manchester Loop Line greenway proposal, please contact Costel Harnasz.